The Montgomery County Sentinel was first published as a weekly newspaper in 1855 by Matthew Fields and has been continuously published, with brief interruptions, until the present. The early focus of the paper was on advertising and politics, with relatively little space devoted to local news. News articles were usually brief and to the point without elaboration. On two occasions, once before and once during the Civil War, the paper suffered brief interruptions while Matthew Fields, a Southern sympathizer, was held by Union military forces. Following the war, publication was continued by Mr. Fields or his family until it was sold in 1932. 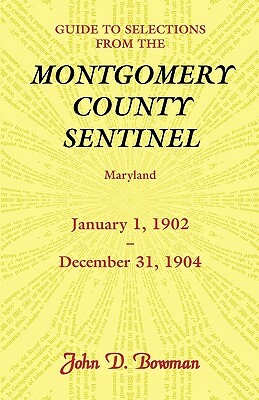 This volume is a compilation of selected Montgomery County Sentinel extracts, taken as before from available microfilm records, which extends the time covered in the previous work. Marriages, deaths, civil appointments, voters, jurors, road notices, significant events—these records are a goldmine of names and dates, with the added benefit of an index to names, places, and subjects. This book is a valuable resource for anyone researching the Montgomery County area. Is your missing relative hiding in these pages?